Reachesay Baba says a blessing before a match at TV5 stadium in Ta Khmau, just south of Phnom Penh. Religion and superstition often play a big part in fight preparation. Nearly all fighters whisper incantations for good luck as they circle the ring ahead of the fight, and many wear protective tattoos inked and blessed by old masters. A friend had said there was a new boxing gym just past the Japanese Bridge in Phnom Penh. Paddy Carson, a former bare-knuckle champion from Durban, had recently moved from Pattaya, Thailand, and opened the Angkor Youth Boxing Club in a sweltering old warehouse on the northern edge of Cambodia’s capital. 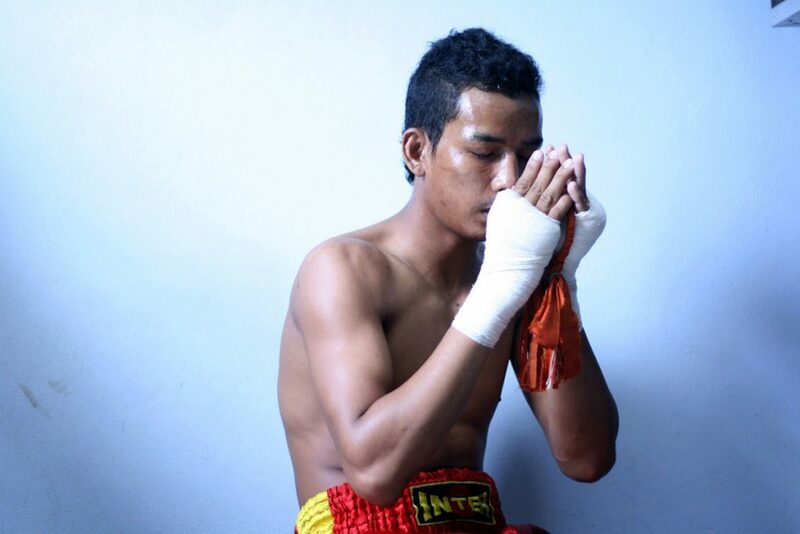 There, in the back, in a small ring with fraying ropes and a muddied blue canvas, Kru Paddy hammered the importance of straight punches and strong cardio into a dozen wiry young fighters with championship dreams. I’ll be showing a few photos from my Phnom Penh Post days on Thursday at the #26 Art Gallery on Street 118. It’s quite the hip little Thursday-night event. Drop by if you can. If I haven’t mentioned it before, I’ve been working with Magnum photographer John Vink on his Quest for Land iPad app — John on photos, me as the dev guy, and journalists Robert Carmichael as the wordsmith. The app was released about 10 days or so ago, and as an iPad app, it’s gotten pretty good reviews from those who took part in our informal beta testing. John has more info on his site, including screen shots and a short movie. And, of course, it’s available on the iTunes store: Quest for Land. 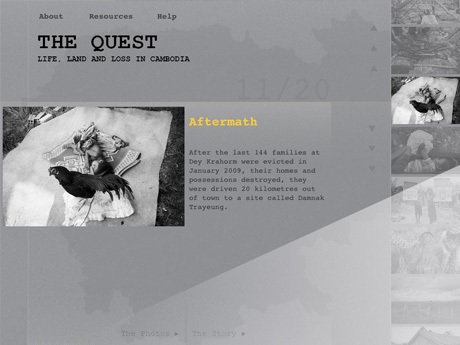 Quest for Land chronicles more than a decade of land issues in Cambodia. There’s a lot on forced evictions and their aftermath, as well as some solid historical and cultural background on land issues in Cambodia. In total, Quest for Land contains about 720 photographs and 20,000 words on the subject. The app costs US$9 — basically that’s a penny per photograph and the words are free — a shocking value proposition. Buy a copy if you can. It’s well worth it. Some smart advice on food photography. Choosing an attractive table setting, beautiful props and/or using interesting angles and exquisite lighting will take the focus off of the food and onto the image as a whole. Creating a scene that has other elements for the viewer to focus on besides the fact that your herring potato salad is clumpy and gross looking is essential. In this image I chose to give the viewer something else to look at in the form of an elegant bowl and a lighting scheme that complemented its modern design. The result is a portfolio piece rather than, and may I borrow a line from Frank Bruni here, a “gastronomic apocalypse”.